Battle of Midway (Smart Strike) wins the BC Dirt Mile at Del Mar on 11.3.2017. Flavien Prat up, Jerry Hollendorfer trainer, Winstar Farm and Don Alberto Stable owners. Breeders' Cup Dirt Mile winner Battle of Midway, who was found to be subfertile earlier this year and subsequently returned to training, could be approaching his next start, according to drf.com. A six-furlong breeze in 1:13.80 on Sunday may indicate that Battle of Midway is ready to start during the Del Mar meeting, said trainer Jerry Hollendorfer. The listed Harry Brubaker Stakes on Aug. 22 may be an option. “He galloped out well. I'd like to run him here if I could,” Hollendorfer said. 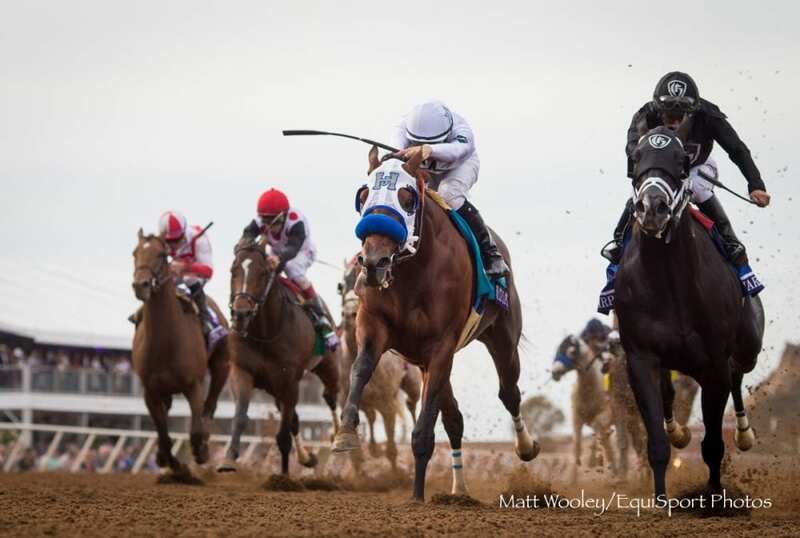 This entry was posted in NL List, Racing and tagged battle of midway, breeders' cup dirt mile, Del Mar, del mar thoroughbred club, harry brubaker stakes, jerry hollendorfer, subfertile by Paulick Report Staff. Bookmark the permalink.